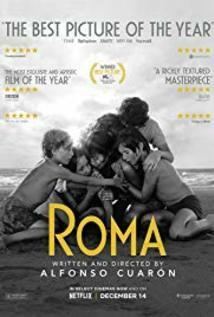 Roma is a deeply personal tone poem of childhood recollection from writer/producer/director Alfonso Cuarón, who also pulls quintuple duty as the film’s cinematographer and co-editor. The story centers on Cleo (Yalitza Aparicio), a young indigenous woman from Oaxaca, working as a domestic for an upper-middle-class family in Mexico City’s Colonia Roma—the neighborhood in which Cuarón grew up. The film is both a loving tribute to the woman who helped raise him and an exploration of familial, societal, and political unrest in the early 1970’s in Mexico. In Roma, Cuarón reverses the aesthetic juxtapositions of his recent work. His impressive Hollywood movies like Children of Men (2006) and Gravity (2013) are expansive special-effects-driven extravaganzas meticulously crafted to create a sense of intimacy, while Roma, by contrast, is a small-scale family portrait presented with sweeping grandeur on a vast cinematic canvas. To a certain degree, Roma conveys the sensation of watching a film from another time, yet it also feels distinctly contemporary in its underlying observations of race, class, gender, and political representation. By casting gifted non-actors like Aparicio and shooting black-and-white in expansive, sun-drenched exteriors and spacious buildings full of windows, Cuarón recalls the Italian neorealist cinema of the 1960s. But the widescreen digital monochrome images of Roma are a far cry from the high-contrast black-and-white celluloid used to capture the unforgettable images of those films. And the emersive Dolby Atmos sound mix Cuarón employs, sometimes to great effect and sometime as a gimmicky distraction, sounds nothing like the rough, mono optical tracks of the neorealist era. But the tone, pacing, themes, and choice of subject feel designed to evoke the humanistic work of ‘60s masters like Vittorio De Sica and Roberto Rossellini, as well as Yasujiro Ozu and Satyajit Ray. Yet unlike the best films by those artist, Roma keeps the `internal lives of its characters at somewhat of a distance from the audience. We don’t glean the full complexities of Mexico City’s history during this time, nor are we granted many specific insights as to who Cleo is, outside of her role in the family. The film is told from her point of view, yet our understanding of her, and the events in her life, feels grounded in the perspective of the young children she cares for. We get an impression of her as an individual, but she remains largely enigmatic. The first two thirds of Roma are quiet, slow, and observational. And though upheavals both personal and political ultimately unfold, the daily life of the family that employs Cleo remains curiously unchanged. Thus we don’t always feel the immediate consequences of each turn of circumstance. Instead, the household minutiae, the personal struggles, and the epic social dynamics have a cumulative effect on the viewer. Roma leaves us with a sensory impression rather than cognitive, born of images and feelings that wash over us like water, a motif Cuarón favors here. The film’s greatest power is its ability to evoke the sensation of reliving personal memories, even though most audiences will not have experienced a childhood quite like that of this filmmaker. Cuarón reverses the aesthetic juxtapositions of his recent work—creating a small-scale portrait on a vast cinematic canvas rather than an effects-driven extravaganza crafted to feel personal and intimate. Aparicio shines as a protagonist we come to know via sensory impressions.